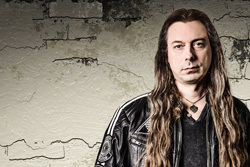 Finnish drummer Mika Brushane (Strike) returns with his Imperium project and second album, Beyond The Stars. While Brushane plays drums, bass, and keyboards, he has guest artists from the European and Finnish music scene to help him put his music to tape. On vocals there's well-known producer Dennis Ward, Markku Kuikka, Rob Lundgren, and Voice of Finland winner Antti Railio. Guest guitarists include Erkka Korhonen, Samuli Federley, and Toni Huovinen. Brushane and Imperium's sound can best be described as Eighties style melodic hard rock properly wrapped in AOR accessibility. All the songs within are filled with an abundance of melody, harmony, and groove with plenty of catchy refrains and oodles of thrilling guitar solos. While all vocalists sing melodic, having multiple voice can sometimes make consistency difficult. On songs such as Learning To Fly and Back In '85, the vocals are rather rough. (Unfortunately, while supplied with the credits, I was not given a list of which vocalist appears on which. So I don't know who or whom are the vocalists on these to songs.) Nevertheless, with these exceptions, the voices of Imperium are just fine. For the songs, as said earlier, they are thoroughly AOR melodic hard rock numbers. Beyond The Stars starts the album as smooth AOR rocker. Then the following Crash And Burn gets a bit heavier and faster with some metal edge. While the vocals sucked on Back In '85, the music is pure melodic hard rock ear candy, suitable as an arena anthem. Getting a different voice for the song would put the song over the top. Another song ready to rock the arena is World On Fire, which has a huge percussive start from Brushane with a lingering light piano line underneath. The song builds with deliberate pacing to rip into strong guitar solo in the second half. And the guitar solos are a definite highlight to this album. Just A Dream, a lighter tune, perhaps a ballad, turns on a sweet synth layer, Brushane's steady rock groove, and smooth vocals. All said, with noted exceptions, Imperium's Beyond The Stars is another fine platter of AOR melodic hard rock from drummer Mika Brushane and his talented Finnish friends and musicians. Recommended. 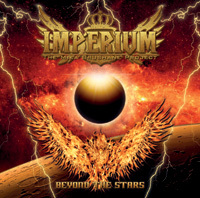 All said, with noted exceptions, Imperium's Beyond The Stars is another fine platter of AOR melodic hard rock from drummer Mika Brushane and his talented Finnish friends and musicians. Recommended.